The Ford EcoBoost 300 at Homestead-Miami Speedway will be the finale for the NASCAR XFINITY Series season Friday night in South Beach. It’s JR Motorsports vs. Richard Childress Racing driver as three of four JR Motorsports drivers are in the final 4 this year. Whether it’s Elliott Sadler, William Byron, Justin Allgaier or Daniel Hemric hoisting the Championship trophy at the end of the day, we’ll have a new first-time NASCAR XFINITY Series Champion. Our Sarah Handy and Jacob Mullins give their take on who they think will hoist the trophy in South Florida. Sarah Handy: Allgaier has two wins this season to go along with 10 top-five’s, and 17 top-ten finishes. While his consistency and wins earlier in the year at Phoenix and then Chicagoland got him this far I just don’t feel he will be the Champion. This isn’t to say he may not win a NXS title down the road. Allgaier has proven he runs and competes much better in the NXS than he did in Cup. (Okay the good equipment helps) While Allgaier (and teammate Byron) have Sadler beat on wins this year, Sadler has them both beat with experience and being in this position previously. I also feel that with Allgaier’s Crew Chief Jason Burdett being suspended for the final race due to an L1 penalty that stems from Phoenix won’t help him in winning the Championship. He went all year and has had consistent finishes, and even a couple victories but now the Crew Chief he’s worked with all season won’t be on top of the box, that must sting. Jacob Mullins: As it relates to the JR Motorsports stable, Allgaier is second in performance behind Byron, statistically. It doesn’t surprise me that there are three JRM drivers in the final race, and out of the three, I think Justin will finish last in the trio. It’s nothing against the No. 7 driver, but I just don’t think he will be the champion. Despite having two wins with the most recent one coming at Chicagoland, a one-mile track, Allgaier hasn’t been that great at Homestead over the years. In seven starts, his only finish inside the top-ten came last year, a seventh place finish. I like Allgaier, but I don’t think he has what it takes to finish ahead of Byron or Sadler. SH: If Sadler doesn’t win the Championship, I feel like Byron could steal the show. While he is young, he does have the experience of competing for a NASCAR Truck Series Championship in 2016. Byron also has 4 wins this season to go along with 11 top-five’s, 21 top-10 finishes and two poles. 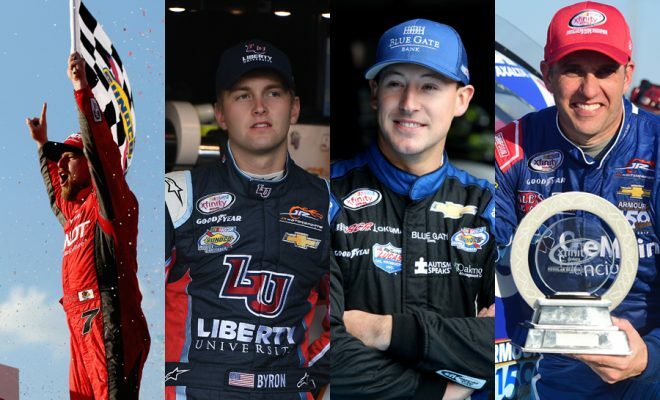 It’s been quite the year for the young driver who will make the jump to the MENCS next season. Byron has seen success at Homestead-Miami by winning the NCWTS finale at the 1.5-mile track last season. JM: I’m going to say it now, Byron will be the 2017 XFINITY Champion. Despite this being his only year in the NASCAR XFINITY Series, the young driver has set the series on fire. 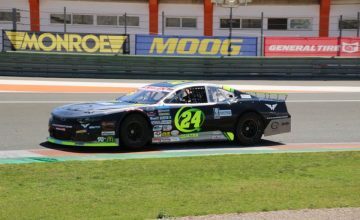 With 11 top-five and 21 top-ten to go along with a pair of poles and a series-best four wins among regulars, Bryon has proved over and over why he’s jumping to Cup next year. With wins at Daytona, Indianapolis, Iowa and Phoenix, Byron has won on tracks where a “rookie” shouldn’t. However, Byron acts as if he is a veteran, and I believe he grew up real quick last season when he was in line to win the Camping World Truck Series title, but with engine issues at Phoenix, he was knocked out of contention for the championship the following week at Homestead. The saying is you see the character of a person in defeat, and Byron took defeat well last season. He’s hungry to be a NASCAR Champion and come Saturday night, he’ll be one. SH: Hemric has been a welcome surprise to the final 4. Most fans knew it would either be Hemric or Cole Custer to grab that final spot at Phoenix. Hemric raced a good race and managed to stay ahead of Custer to stay alive for Homestead-Miami. While I believe Hemric comes home with a top-10 to finish out the season I think it’s a bit of a jump to pick him to win the NXS Championship. Okay, so he hasn’t won this year (Sadler hasn’t either), but again it comes down to experience. With 7 top-five’s, 16 top 10’s and one pole he has had a fairly consistent season. I just personally feel it’ll be hard for Hemric to beat out three JR Motorsports cars for the Championship. JM: There isn’t much I can say about Hemric. He is statistically the fourth best driver in the Championship and I don’t see him finsihing above the dominacne of the three JR Motorsports machines. With seven top-five and 16 top-ten finishes in 2017. With an average finish of 12.5 in the 32 races this season, I don’t see him truly contending for the title. Sarah Handy: Aside from the fact that I’ve been a Sadler fan since he was in the MENCS he is my pick to win the NXS Championship and here’s why. While the driver of the No. 1 Chevrolet for JR Motorsports hasn’t won a race in 2017 where as in 2016 he had 3 wins he has been nothing short of consistent this year, which isn’t really that surprising. Sadler has 12 top-five’s, 24 top-10’s and one pole this season. He also won the regular season Championship. Consistency has been key even without having visited victory lane. Sadler has been in this position before and while he hasn’t come out on top he has the experience. I feel that is key here: Experience. Homestead all in all isn’t a bad track for the veteran driver either. 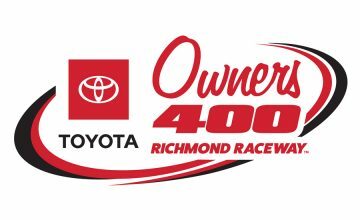 In 11 NXS starts at the 1.5-mile track Sadler has an average start of 7.2 and an average finish of 15.9. Don’t let that finish worry you though because last year in this race he finished in the 3rd position after starting 2nd. JM: If Sadler wins the Championship, it would be a long time coming for the NASCAR journey man. I think he finishes second this year just like he did last season, but only because he hasn’t put up some of the stats as Byron has. However, what Sadler does have goes a long way, experience. Coming off a 2016 season where he visited victory lane three times, Sadler finished second twice in 2017. However, the captain of consistency this year, won the regular season title. In the seven playoff races this season, Sadler has only one finish outside the top-ten, an 18th place finish at Phoenix, but in a race that is top-finisher takes all, Sadler’s consistency, just won’t cut it. SH: Elliott Sadler is long overdue to win a NXS Championship and must be a fan favorite to a certain extent. He has finally seen the success he deserves even if it’s not in the MENCS. In my opinion though if it’s not Sadler that’s the 2017 Champion on Saturday it’ll be William Byron…he does have momentum with him from winning last weekend in Phoenix. JM: I believe this is a two-car race – Byron and Sadler – with the edge going to Byron. Byron, who could very well win the race Saturday night, will become the next NXS Champion while Sadler comes up just short as the elusive NASCAR title slips by again. Who do you think will win the XFINITY title at Homestead-Miami Speedway on Saturday night? Let us know in the comments on our Facebook page (@RubbingsRacing) or on our Twitter page where we share the same social media handle as Facebook.